Thank you, ARS, for the reminder - it helps me to remember. 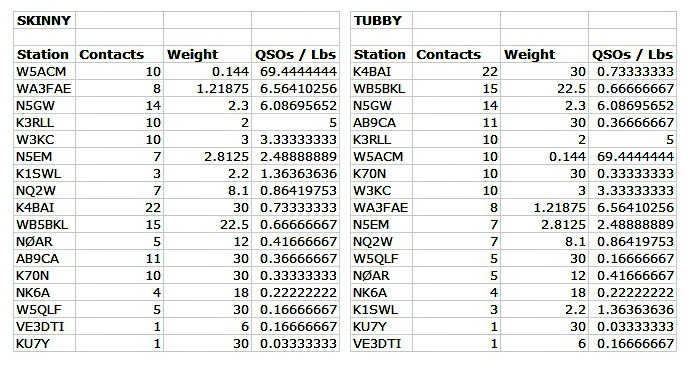 I managed 10 QSOs above 7040 using the KX3 @ 5w with the 23' vertical. Does anyone QSY to 80m? I listened between 3550 and 3570. 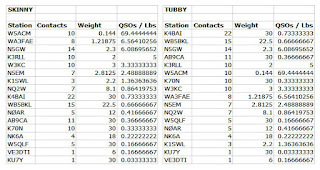 Heard QSOs, but no SP. I don't know the exact weight, but I'll say Tubby? (KX3, BY-1, Pro-Audio Engineering 12v mini AC supply, K0IBK Low Loss PwrGate) This could become habit forming. Thanks to all. KX3 at 2 watts to cfz. 20M was dead at this QTH. 40M sounded good. 80M was fair with QRN from approaching wx front. I had to quit after the first hour because I had forgotten to recharge the internal batteries. K3/10 @ 5W to a 40M dipole or a 40M extended double Zepp. 9 states this month split between 40 and 80M. Best signals: 40M, AB9CA. 80M, WA8ZBT. Several of the usual suspects are missing from my log this month - hope it was just propagation . . . My thanks to all. Had fun.